With a history spanning over 20 years, Billet Collins is proud to be recognized as one of Washington, DC’s most influential decorative painting studios. 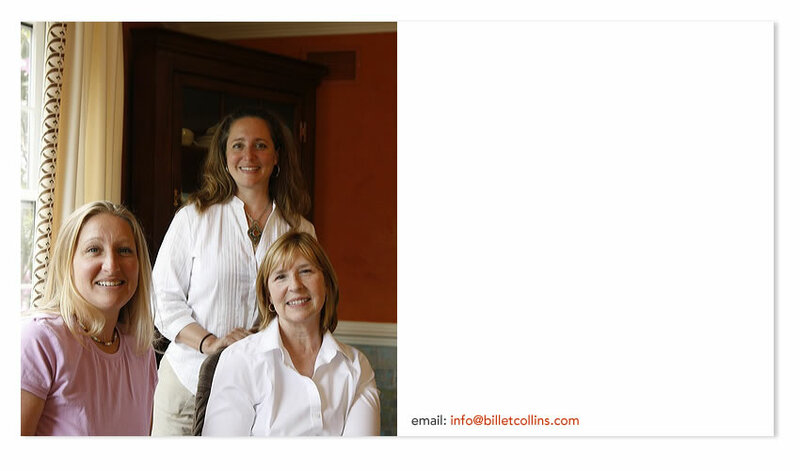 Barbara, Amy and Kellie, the three main forces of Billet Collins, have built a 20 year reputation of innovative hand painted finishes, dramatic patterns and reliable customer service. As a family of artists, it is important to us that our craftsmanship is superb, but it is also important that our business run smoothly. Customer service and organization is key. Thanks to our steadfast admirers, our hand painted finishes that were initially found only in the nation’s capitol are now celebrated across the eastern seaboard. We’re very proud of the fact that you’ll find our work in residential homes and commercial spaces, as well as several historic spaces. We try to use green products where possible and can offer low and no VOC paint finishes, thanks to a few great new lines of paints and products, and diligent research. So here we are today, two decades later: meeting fantastic clients, creating new paint and design techniques, and working with the top designers in the country! Please download the latest Flash Player from Adobe to see our selected portfolio.